Personal Protective Equipment (PPE) includes all clothing and other work accessories designed to create a barrier against workplace hazards. Examples include safety goggles, blast shields, hard hats, hearing protectors, gloves, respirators, aprons, and work boots. PPE should not be used as a substitute for engineering, work practice, and/or administrative controls to prevent exposure to hazardous chemicals. For example, a respirator is not meant to be worn by an assembly line worker during his/her entire work shift; other methods such as a ventilation system or replacement of hazardous substances/processes should be utilized. 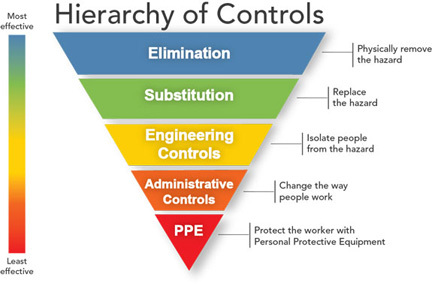 However, PPE can work in conjunction with such preventative measures or when such controls are not possible. Also keep in mind that PPE protects only the user - it does nothing to remove the hazard from the workplace. For example, a respirator may help protect the wearer from toxic fumes, but does nothing to protect others in the vicinity. How to properly put on, remove, adjust, and wear PPE. 29 CFR 1910.133 PPE: Eye and Face Protection. The employer shall ensure that each affected employee uses appropriate eye or face protection when exposed to eye or face hazards from flying particles, molten metal, liquid chemicals, acids or caustic liquids, chemical gases or vapors, or potentially injurious light radiation. 29 CFR 1910.134 PPE: Respiratory Protection. In any workplace where respirators are necessary to protect the health of the employee or whenever respirators are required by the employer, the employer shall establish and implement a written respiratory protection program with worksite-specific procedures. 29 CFR 1910.138 PPE: Hand Protection. Employers shall select and require employees to use appropriate hand protection when employees' hands are exposed to hazards such as those from skin absorption of harmful substances; severe cuts or lacerations; severe abrasions; punctures; chemical burns; thermal burns; and harmful temperature extremes. Additional standards cover items such as hearing protection, foot protection etc. Many of OSHA's other standards require the use of PPE. 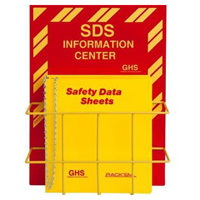 Safety wall posters are a terrific way of reminding employees of proper procedure. Get yours at Safety Emporium. "Personal Protective Equipment for Chemical, Biological, and Radiological Hazards: Design, Evaluation, and Selection", hardcover, 348 pages, 2012. Estimated price $147.20. Info and/or order . "Quick Selection Guide to Chemical Protective Clothing, 6th Edition", Spiral-bound, 272 pages, 2014. Estimated price $45.60. Info and/or order. "Chemical Protective Clothing, 2nd Edition", hardcover, 530 pages, 2003. Estimated price $66.58. Info and/or order . "Aid for Decontamination of Fire and Rescue Service Protective Clothing and Equipment After Chemical, Biological, and Radiological Exposures. ", Paperback, 110 pages, 2013. Estimated price $12.71. Info and/or order . "Industrial Hygiene Control of Airborne Chemical Hazard", hardcover, 728 page, 2006. Estimated price $135.87. Info and/or order. OSHA requires that MSDS's list information about appropriate PPE for each substance. Pay careful attention to these as not all PPE is appropriate at all times. For example, certain gloves will do little to protect you from certain chemicals; see the glove selection guide links below for more information. Likewise, an organic vapor cartridge respirator will be useless at protecting you from an atmosphere deficient in oxygen. 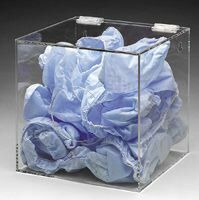 In addition to using PPE appropriately, remember that every piece of PPE has limitations. For example, gloves may develop small holes and respirator cartridges generally do not indicate when they need replacement. Even appropriate PPE does not provide a 100% guarantee of safety! Eliminate or remove the hazard. Substitution of less hazardous materials or processes. NIOSH has a great PDF file you can download titled A Guide for Evaluating the Performance of Chemical Protective Clothing (1.5 Mb). OSHA Technical Manual: Chemical Protective Clothing covers selection, usage, decontamination, training and more. OSHA publication 3151, Assessing the Need for Personal Protective Equipment: A Guide for Small Business Employers is a 189 Kb PDF file. OSHA's eTool Selecting PPE for the Workplace. OSHA's Personal Protective Equipment Fact Sheet (287 K PDF download). 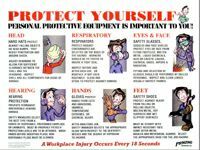 OSHA's Construction Safety and Health Outreach Program has a page titled Personal Protective and Life Saving Equipment. Glove Selection and Usage at the University of California, San Diego. Includes info about latex allergies and more. Chemical Application & Recommendation Guide for gloves at Ansell Healthcare, the world's largest manufacturer of protective gloves and clothing. Search or download. Free-training.com has a free PPE course avilable on-line. The U.K. HSE offers A short guide to the Personal Protective Equipment at Work Regulations 1992 (1.6 Mb PDF download). Letter From A Nobel Prize Laureate on The Loss of Sight In One Eye Due To A Cryogen Accident, one that could have been avoided with PPE. Chemical Splash to the Eyes In Spite of Goggles - yes, it can happen when you forget that PPE is one layer in a multi-layer approach to preventing injury. See also: action level, administrative controls, engineering controls, HMIS, permissible exposure limit. Entry last updated: Wednesday, June 13, 2018. This page is copyright 2000-2019 by ILPI. Unauthorized duplication or posting on other web sites is expressly prohibited. Send suggestions, comments, and new entry desires (include the URL if applicable) to us by email.